Grilled chicken over a veggie packed salad is the perfect warm weather dinner for us. This Southwestern inspired meal starts with a simple salad of romaine, tomatoes, corn, onions, black beans and cheese. Homemade fried tortilla strips give it a nice crunch while the chipotle dressing adds a creamy, tangy and smoky flavor. 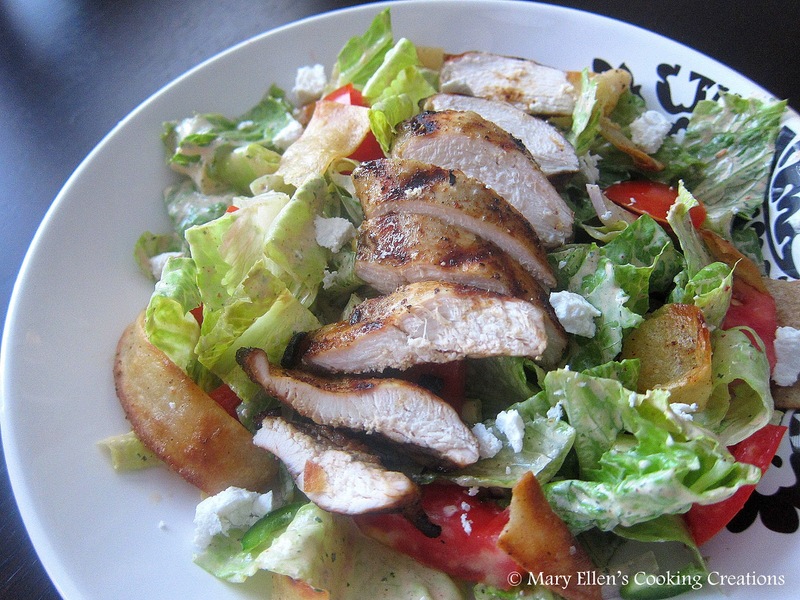 Finally, the marinated and grilled chicken served warm over the cold salad is just perfect. This simple dinner will definitely fill you up! Combine these ingredients until blended. I used my handheld immersion blender, but a food processor or blender would also work. Note - this makes enough for 4 or more salads. Mix the olive oil, lime juice, zest, garlic, chili powder and cumin. Pour over the chicken and marinate for 4 hours. Grill until internal temperature reaches 165 degrees F. Let rest 5 minutes before slicing. Serve over the salad. Cut 5 corn tortillas into strips. Heat 1/4 inch of oil in a deep pan over high heat. Add the tortilla strips and cook until lightly browned. Remove and place on paper towels and quickly season with salt. Serve over the salad. Toss all ingredients except cheese with the salad dressing and top with the sliced chicken, tortilla strips, and fresh cheese. Yum!! I love your changes--the tortilla strips are a great addition.